French philosophical writer and translator of the thirteenth century. The supposition that Solomon was a native of Melgueil, or Melgueir, the present Mauguio, is based on the fact that "Melgueiri"( ) is always a part of the name. Wolf ("Bibl. Hebr." iii., Nos. 2007-2008) interprets the epithet as either "the Algerian" or "the Algarian," the latter reading being adopted by Renan ("Averroès et l'Averroïsme," p. 192, Paris, 1866). According to Saige ("Les Juifs de Languedoc Antérieurement au XIVe Siècle," p. 126, ib. 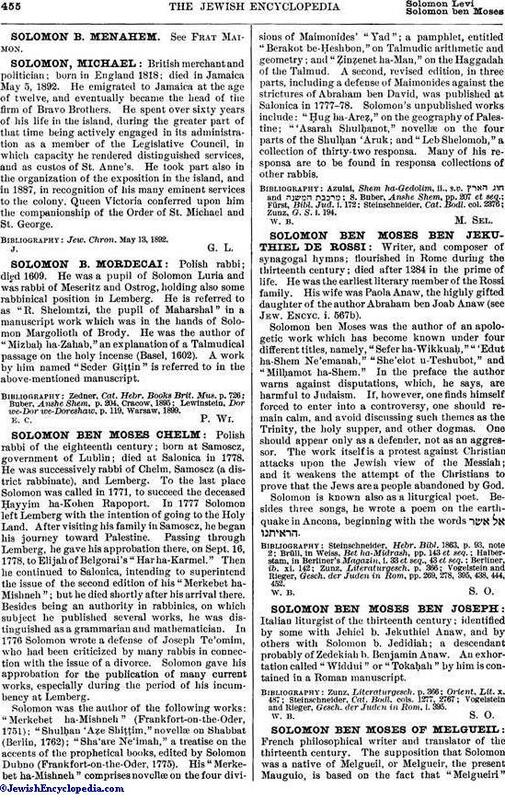 1881), Solomon ben Moses of Melgueil is the same as the Solomon of Melgueil (a native of Béziers who had settled at Narbonne) who is mentioned in Latin documents of 1284 and 1306—the one of 1284 styling him and his brother Vital "the Jews of the king," and the one of 1306 describing him as one of those whose property had been confiscated. Steinschneider ("R. E. J." v. 278 et seq.) declares this identification doubtful. Isaac Lattes ("Sha'are Ẓiyyon," p. 73) speaks of a Samuel b. Moses Melgueiri (= "of Melgueil") who was a great scholar and who wrote works in all departments of science. This passage is reproduced by Azulai ("Shem ha-Gedolim," i. 176), who adds that among Solomon's works must be especially mentioned his "Ḳeẓ li-Tekunah," "Sefer ha-Melek," and "'Asarah Debarim." Zunz ("Z. G." p. 472) affirms that "Samuel" in this passage is a copyist's mistake for "Solomon," and he consequently ascribes the three works just mentioned to the Solomon of this article. It may be said that Isaac de Lattes himself ascribes these works to Moses ibn Tibbon, and that this opinion is supported by Gedaliah ibn Yaḥya ("Shalshelet ha-Ḳabbalah," p. 54b, Venice, 1587). Wolf, furthermore (l.c. Nos. 2001b, 2007), followed by Zunz (l.c.) and other scholars, identifies Solomon , the translator of Aristotle's "De Republica" and "Meteorologica," with Solomon of Melgueil. But Saige (l.c.) holds with Renan that the former Solomon is a different person, the name meaning "a native of Urgel, Spain." Solomon was incontestably the author of "Bet Elohim," a philosophical commentary on the chapter in the Book of Kings which deals with the construction of Solomon's Temple. This work (not yet published) is in three parts, respectively entitled "Sha'are Ẓedeḳ," "Bet Middot," and "Sod ha-Miẓwot," and is written on the same lines as Maimonides' "Hilkot Bet ha-Beḥirah," but in a more Orthodox manner. Solomon translated Avicenna's compendium of Aristotle's "De Cœlo et Mundo," under the title "Sefer ha-Shamayim weha-'Olam." In the introduction Solomon says that he translated this work from the "language of the Christians" (Latin), and asks the student's indulgence for the mistakes which he may have made. Many passages of this translation are quoted by Gershon b. Solomon in his "Sha'ar ha-Shamayim," and therefore a decision as to the exact date of Gershon's composition may help to determine that of Solomon's work. 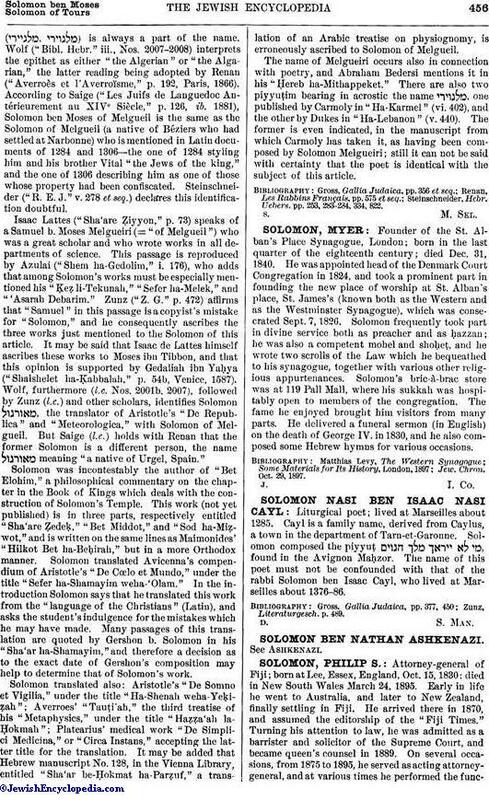 Solomon translated also: Aristotle's "De Somno et Vigilia," under the title "Ha-Shenah weha-Yeḳiẓah"; Averroes' "Tauṭi'ah," the third treatise of his "Metaphysics," under the title "Haẓẓa'ah la-Ḥokmah"; Platearius' medical work "De Simplici Medicina," or "Circa Instans," accepting the latter title for the translation. It may be added that Hebrew manuscript No. 128, in the Vienna Library, entitled "Sha'ar be-Ḥokmat ha-Parẓuf," a translation of an Arabic treatise on physiognomy, is erroneously ascribed to Solomon of Melgueil. The name of Melgueiri occurs also in connection with poetry, and Abraham Bedersi mentions it in his "Ḥereb ha-Mithappeket." There are also two piyyuṭim bearing in acrostic the name , one published by Carmoly in "Ha-Karmel" (vi. 402), and the other by Dukes in "Ha-Lebanon" (v. 440). The former is even indicated, in the manuscript from which Carmoly has taken it, as having been composed by Solomon Melgueiri; still it can not be said with certainty that the poet is identical with the subject of this article. Steinschneider, Hebr. Uebers. pp. 253, 283-284, 334, 822.